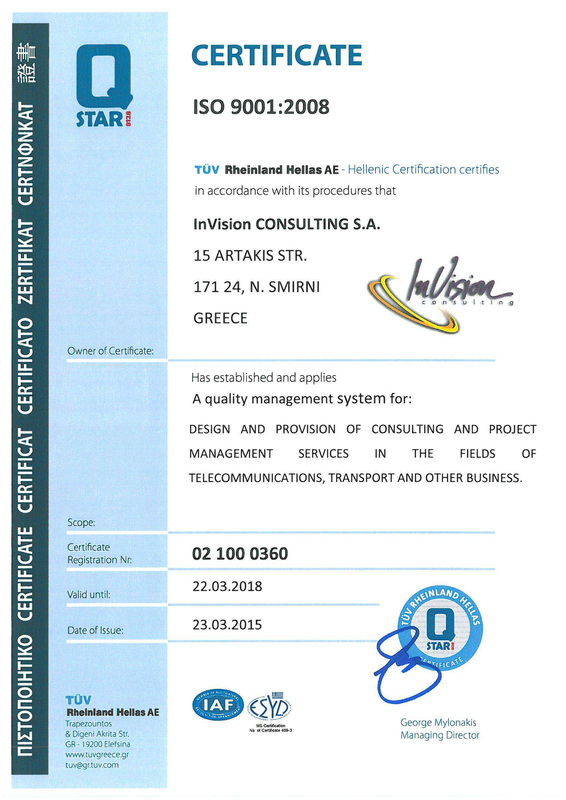 Invision has installed and implemented a Quality Management System authenticated by ISO 9001: 2015 to design and provide consulting services and project management services in the fields of telecommunications, transport as well as other business sectors in accordance with the legal and regulatory requirements of the current Greek and European Community Legislation. In redesigning the Quality Management System, the company takes into account the organization’s operating framework as well as all other relevant parties’ requirements regarding the system. The Quality System is applied on all levels of organization as well as by all staff who’s related to the quality of service provided, since our quality of service policy is an integral part of the company’s strategy and transpires the whole of the activities in which it participates and the services it offers. Its aim is the ever-increasing satisfaction of its customers’ needs regarding both technical requirements as well as the general perception of customer satisfaction through established processes and procedures. The company is committed to the continuous improvement of the Quality System as well as staying in compliance with any legislative and regulatory requirements.